(Bloomberg) -- House Agriculture Committee Chairman Michael Conaway said he’s delaying the release of a draft law renewing farm and nutrition programs to try and produce a bill with bipartisan support after intense Democratic opposition over cuts to the food-stamp program raised the possibility the bill could be imperiled. "What I don’t want to be is in those negotiations, put something out there and have to change it," the Texas Republican told reporters Tuesday. "We’re in negotiations." Representative Collin Peterson of Minnesota, the ranking Democrat on the farm panel, said the additional work requirements for more recipients and other changes proposed by Republicans would drop 8 million people from the Supplemental Nutrition Assistance Program, dooming support from Democrats. Conaway has denied that many people would lose benefits, but budget-hawk Republicans may balk at any plan that doesn’t do enough to cut food stamps and farm subsidies. Conaway said he won’t rule out releasing a farm bill designed to appeal only to Republicans, which would put it at risk in the Senate, where Democratic votes are needed. He said he is still trying to gain Democratic support. The chairman had previously said his committee would send a farm bill to the House floor with the goal of a full-chamber vote by the end of March. That becomes more difficult without any bill this week. Senate Agriculture Chairman Pat Roberts said it’s crucial to get the farm bill to get done this year because of the possibility that tariffs imposed by President Donald Trump might trigger retaliation that would hit farmers. “At a time when farm income is down and exports are threatened from a protectionist trade policy it is the duty of the agriculture committees to provide farmers with some certainty,” Roberts of Kansas said. The Senate may release its version of the legislation in April, he said. The impasse echoes divisions that delayed the current farm bill by nearly a year-and-a-half when it was last renewed in 2014. It also casts doubt on how much money will go to grocers such as Kroger Co. via the food-stamp program as well as the shape of subsidies paid to farmers who are struggling with low profits. The bill, the cost of which has topped $ 100 billion in previous years, authorizes programs overseen by the Agriculture Department, ranging from payments to growers of corn and soybeans and funds to prevent forest fires to nutrition to aid poor people. The current farm law ends Sept. 30, after which subsidies begin to phase out. 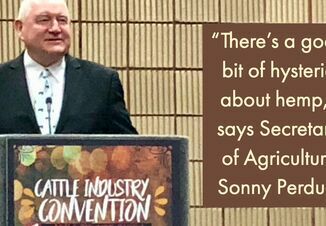 Lawmakers from both parties as well as Agriculture Secretary Sonny Perdue predict that this year’s law will be more evolutionary than revolutionary, after farm programs were revamped in 2014. Still, farmers are becoming more dependent on government payments, as an agriculture boom that ended around the time the last law was passed has left farmers expecting their lowest profits since 2006. Dairy and cotton producers are seeking more money, and conservatives continue to target food stamps as wasteful government spending, along with farm subsidies they call too generous. Perdue in January said work-eligibility rules are necessary to discourage a “lifestyle” of welfare dependence, and in February proposed a “Harvest Box” program of food kits distributed to the poor as a cost-saving replacement for some SNAP aid. Roberts last year signaled a tough stance on food-stamp fraud, even as also acknowledged that major changes were less likely in the more evenly-divided Senate. Senator Debbie Stabenow of Michigan, the top Democrat on Senate Agriculture, said that House-crafted food-stamp cuts as proposed are "not going to fly" in her chamber. "There’s no question. We are not doing that in the Senate," she said on Monday. The farm bill’s complexity makes it difficult to assemble a bipartisan coalition that can get it through the House – and cuts that make a Republican-only bill possible then founder in the Senate, said Josh Sewell, senior policy analyst for Taxpayers for Common Sense in Washington and a subsidies critic. “It’s a mishmash of a lot of policies to begin with, and that creates a lot of headwinds,” he said. While some Republicans, often the ones most interested in maintaining farm subsidies, want to keep food-stamp cuts minimal so as to ease passage in the Senate, others push for bigger change to both nutrition and farm-aid spending, he said. In 2017, spending on food stamps fell 15 percent, to $68 billion, from its peak four years earlier, and about 41.7 million people were using the program as of November, the most recent month available. But with that program still responsible for up four-fifth’s of the bill’s spending, disputes over its mechanisms may derail it, said Jim Weill, head of the Food Research and Action Center in Washington, which seeks to end poverty-related hunger. “I’d rather see no farm bill than anything that looks like what Conaway has put on the table,” he said.